A teenager has been banned from attending all football matches in the UK following trouble at Burnley games . Billy Rambadt (19) of Elim View, Burnley, was handed the three-year banning order after a trial at Burnley Magistrates' Court . Rambadt had become involved in anti-social behaviour at matches involving the Clarets both in the ground and around the town centre. Chief Insp. 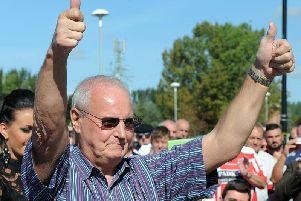 Phil Hutchinson said: “The majority of people who attend football matches are law abiding fans who simply want to watch a good match and enjoy the experience. “However there are still a very small minority of people intent on causing trouble and it is our intention to do everything within our power to stop them. “We are pleased to have secured this banning order and hope that this firm action sends a clear message to others who attend football matches that violence, disorder and anti-social behaviour will not be tolerated. Anyone with information or concerns about anti-social behaviour at a football match should speak to police officers or stewards at the ground.